A CHARMing day at ULB will be hosted in the Solvay Room, building (bâtiment) NO, 5th floor, Plaine Campus, ULB (see image here beneath or follow this google map link). Red Circle: building NO, conference venue. Yellow Circle: authorized parking. La Plaine ULB campus is directly at the exit of the Namur highway. For the entrance number 2 (access 2) go left in boulevard du Triomphe / Triomflaan. At highway exit, take the direction to Brussels South. On boulevard général Jacques / Generaal Jacqueslaan, turn left to boulevard de la Plaine. Quit the highway at Drogenbos and follow the directions to the center of Brussels center. When on avenue Brugmann / Brugmannlaan, turn in avenue De Fré / De Frélaan and cross chaussée de Waterloo / Waterloosesteenweg to get to the bois de la Cambre / Ter Kamerenbos. Keep straight on, you will pass two cross-lights and turn on the first at the right. Follow the boulevard général Jacques / Generaal Jacqueslaan, turn left to boulevard de la Plaine. Follow the directions to the center of Brussels and after follow the ring (tunnels) to get to the bois de la Cambre / Ter Kamerenbos, go into the right tunnel and get to the end of avenue Louise / Louizalaan. At the beginning of avenue Franklin Roosevelt, turn into boulevard Général Jacques / Generaal Jacqueslaan, turn left to boulevard de la Plaine. Follow the ring up to the exit of thehighway from Liège and so take the direction to Brussels South. On boulevard général Jacques / Generaal Jacqueslaan, turn left to boulevard de la Plaine. 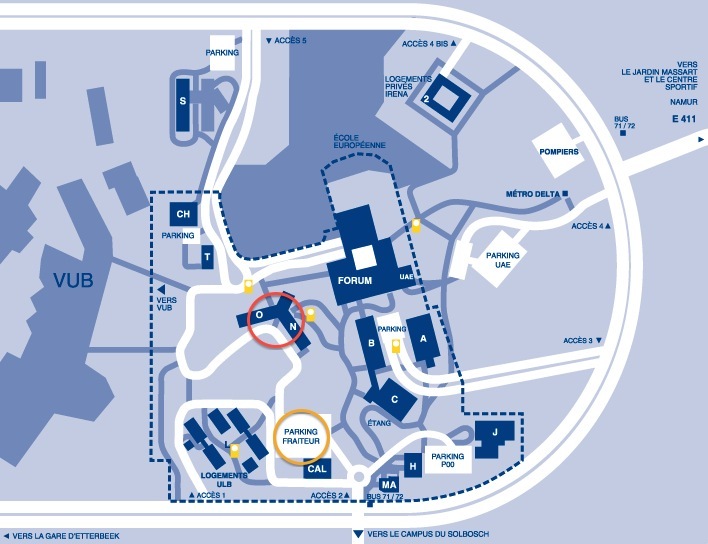 All the participants coming by car can have an authorization to enter the ULB reserved "Parking Fraiteur" (yellow circle in the image at the top). In order to do so, they have to communicate their intention to the LOC who will send them back a document that has to be placed on the dashboard of the car. Attention! The authorization gives you the access to the ULB parking, but no place can be reserved in advance: first come, first served. Otherwise there are several public parking spots nearby the ULB campus.